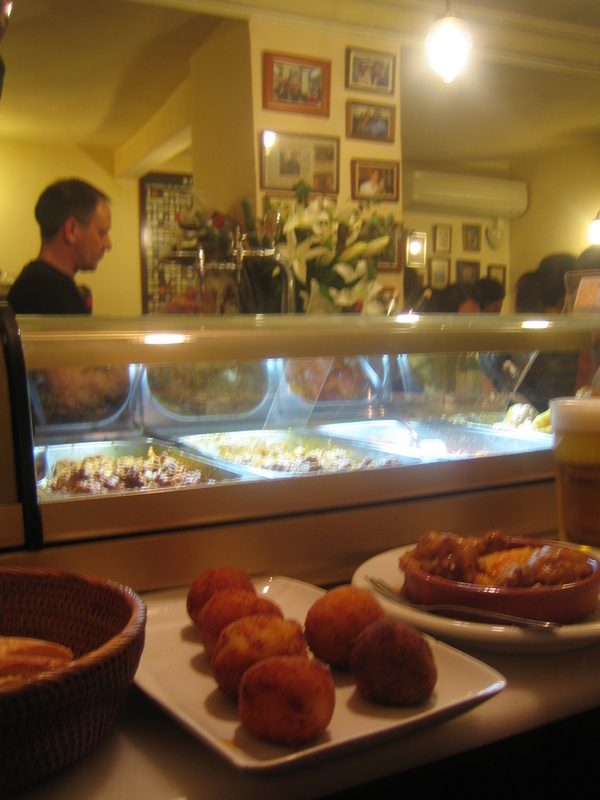 The best croquettas in Madrid? Dinnertime was fast approaching in Madrid. Never mind that we were still sat in 100 Montaditos after a novelty-but-actually-pretty-edible afternoon snack, it was already time to consider restaurant options for the evening ahead. Running my finger down the entries in Lonely Planet, I found a wealth of cuisine types at our disposal, with no shortage of local food: Tapas…Tapas…More Tapas…Thai (“No, we’re in Spain”)…Tapas…Tapas…Italian (“Ditto”)…Modern Spanish…Croquettas…Tapas…Tap—WOAH THERE!!! A whole restaurant devoted to croquettas? This I had to visit. So now, to satisfy my croquetta obsession, we were venturing into new territory, heading along Gran Via towards Malasaňa, a barrio (neighbourhood) that the book describes as “the stuff of Madrid legend … pushing hedonism to new limits.” Perhaps we were asking a bit much from a Tuesday night at the tail-end of December, but after reading such praise we had expected Calle Madera to be more than the dark and isolated alley on which we found ourselves. After some fruitless wandering, I was all for giving up. No way could there be good croquettas here. Muggings, more like. Or dead cats. Perhaps we would become croquettas? But The Warren had faith. “Let’s go a little further” turned out to be the wisest remark of the night (closely followed by “Dos mas, por favour”, a phrase that would be repeated a good few times). Suddenly, out of the darkness there was light, glowing softly through narrow, red, partially graffitied double-doors. 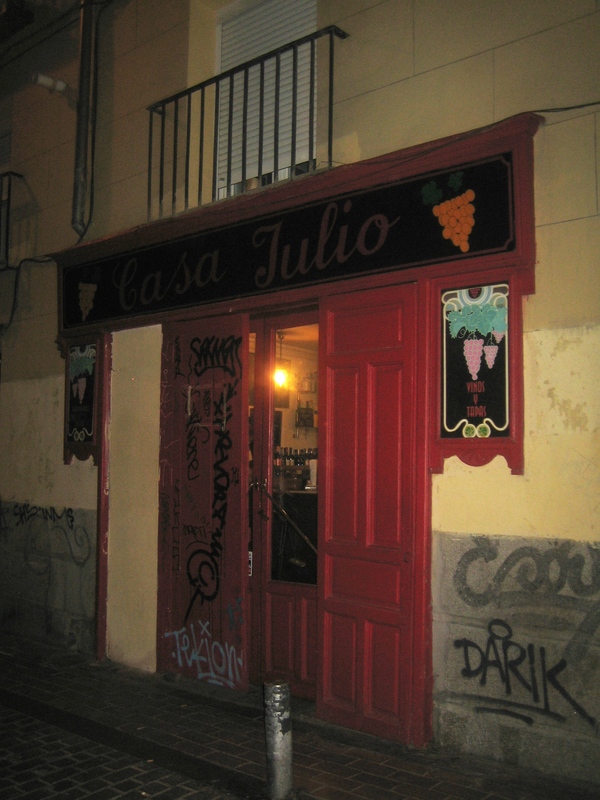 Casa Julio. You could easily miss it or dismiss it, destined never to join the throng of happy Spaniards just visible behind the steamed-up glass. Getting a spot at the bar was like an Olympic sport. The Warren proved very skilful at it (as one of five siblings, his mealtime reflexes have had a lot of practice) and after just one cerveza we gained an advantageous corner position. We were ready to do serious damage to the menu. And damage we did. Croqetta frenzy. Queso and jamón as standard. Then a couple of wildcards: atun con huevo (tuna with egg) and espinacas, pasas y gorgonzola (spinach with raisins and gorgonzola). The spinach ones took surprise gold. We also polished off a portion of albóndigas: chubby meatballs and hefts of potato in a delicious sauce, a basket of pane, and patatas bravas muy, MUY picante. I lifted that first chunk of potato in trepidation. Hmmm – one can only assume the Spanish are cowardly when it comes to spice, as I barely batted an eyelid, let alone broke a sweat. 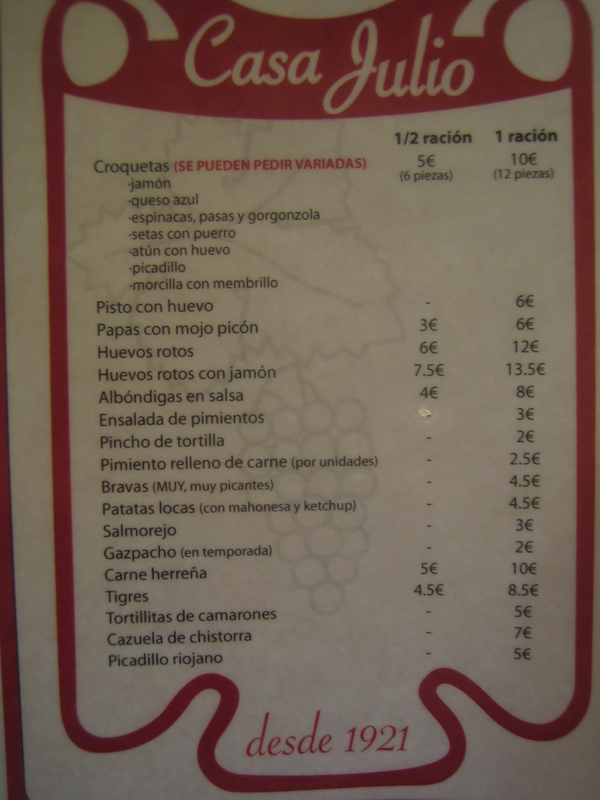 All of the above was washed down with the local cerveza – Mahou – and then, for just €9, a bottle of Spanish Cava (The Warren loves his Cava). We are definitely Casa Julio fans. The staff were friendly, the clientele was an interesting cross-section of ages and types, the place was cosy and welcoming. And the croquettas didn’t let me down. In true Walder-Warren fashion, we stayed on until closing time.